AURGGHH...Matey. 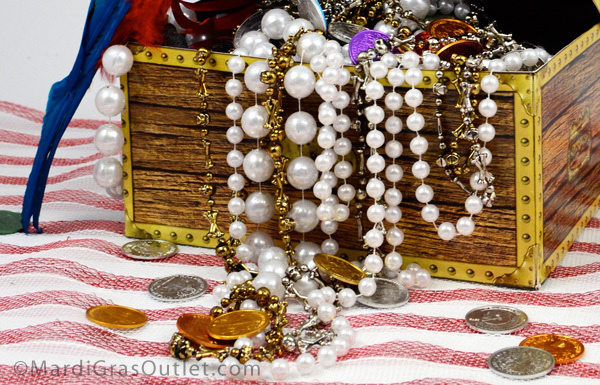 If you're hosting a band of pirates for a summer birthday party, keep in mind that Beads and doubloons are good for more than just Mardi Gras festivities. These sparkly jewels are great for pirate treasure (or booty...as children laughingly call it.) A pirate treasure chest is the centerpiece of any jolly roger themed party. Let your pirate crew dress in their favorite pirate garb- think eye patches, bandannas, swords and parrots. Add in an adventurous treasure hunt to make it an event everyone will remember. This pirate treasure chest serves as the bounty and the party favors. Everyone gets to take home gold, pearls and jewels. 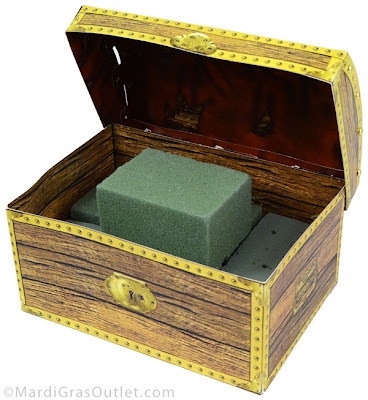 1 Large Treasure Chest Box 11.75" x 8"
This paperboard treasure chest requires some minimal assembly, since it comes flat. Assemble the chest, and then fill the bottom with floral foam (this used 3 pieces). Add another half piece of dry floral foam in the center for more height and dimension. Another option is to stuff the treasure chest with crumpled paper first. 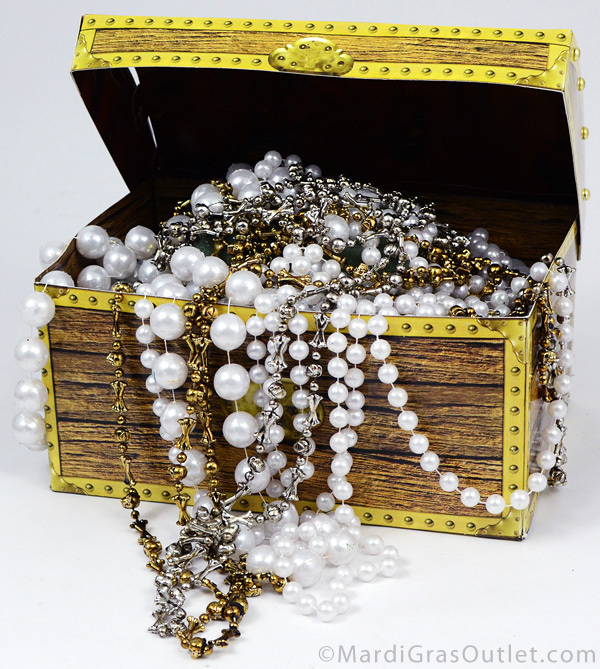 You can also fill the chest completely with pearl strands and coins, just get enough to fill it up (about 15 packs of beads). That way you can use the centerpiece as a party favor holder as well. We used pearl Mardi Gras beads, which are inexpensive. Skull and bones necklaces were also added. Place enough to cover the floral foam. 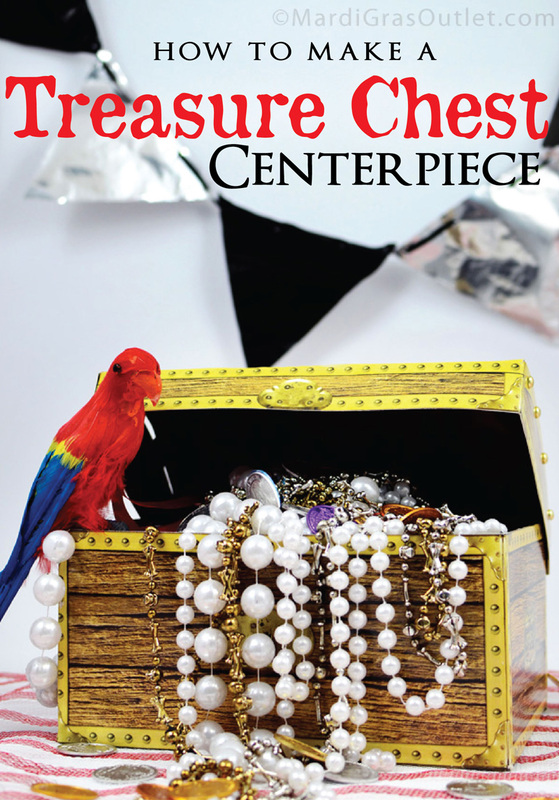 Let some drape over the edges, to make the treasure chest look fuller. 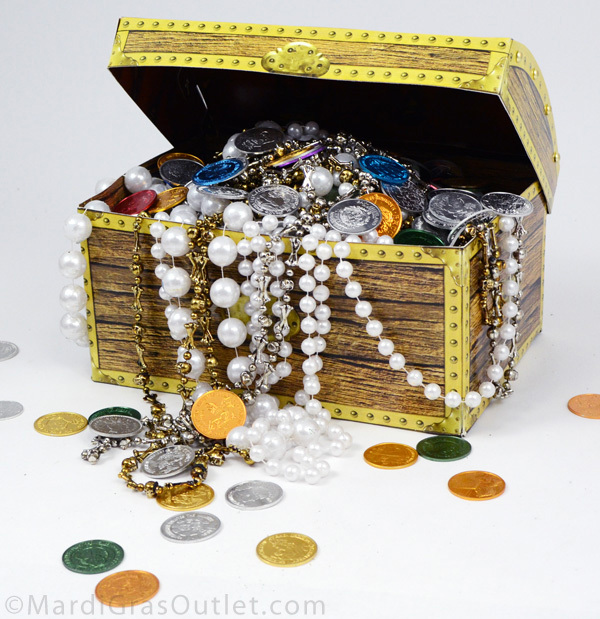 Doubloons were scattered in the treasure chest and around the table. 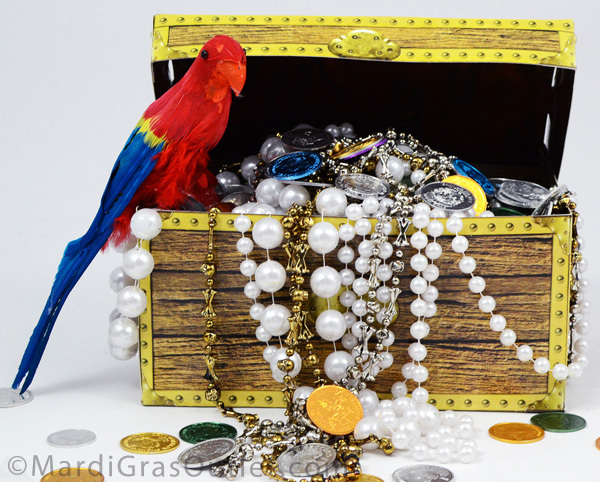 This fake red parrot adds a focal point and color accent to the pirate centerpiece. Glue or tie the parrot at the left front edge of the chest. 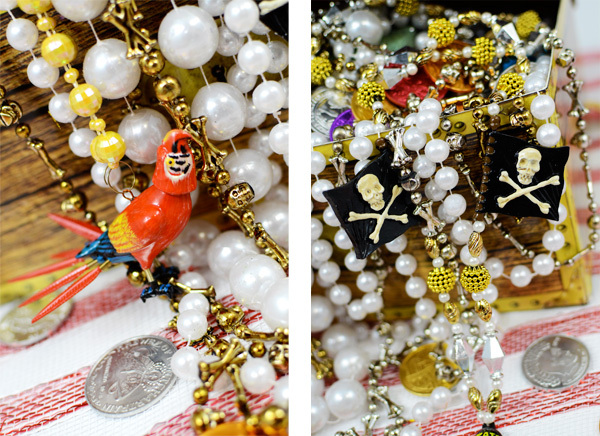 Using a couple specialty beads such as the Bobble Parrot Bead Necklace and the Pirate and Skull Flags Necklace, we added variety to the centerpiece. You might also consider the Bandanna Pirate Necklace, Cartoon Pirate Necklace, Fierce Pirate Necklace, Four Pirates Necklace or any other ones that strike your fancy! 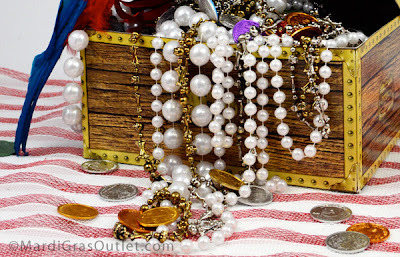 All these and more are available at MardiGrasOutlet.com in our Pirates, Parrots and Skulls section. 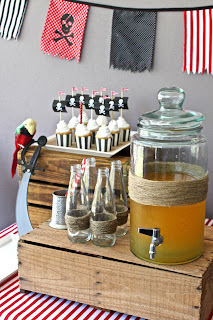 You can also construct a pirate themed garland with triangle flags for more decorations. It's very easy to make! Keep scrolling down for simple instructions. The actual amount you need of each of the above supplies will depend on how long you make your display and bunting. The 26" rolls will allow you plenty of material to spare for future projects! 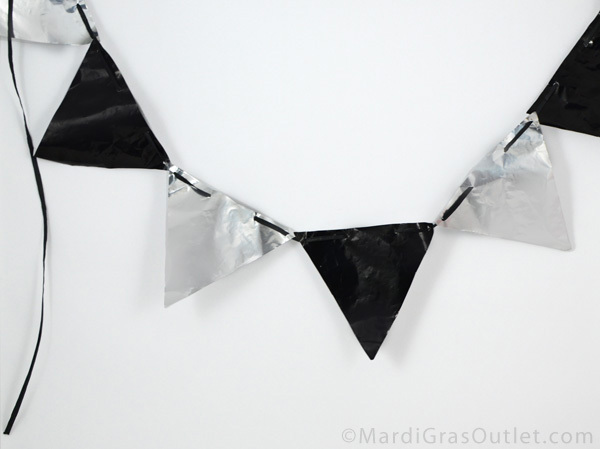 You could also use a thicker patterned craft paper or fabric to create this bunting. If you would like, you can create a template for this part of the process out of cardboard. Use a ruler to draw a triangle that is 8" x 8" x 9" or any other size you desire onto a piece of cardboard and then cut the shape out to form a template. We made the top of our flag slightly wider than the two sides, but you could easily vary the dimensions. 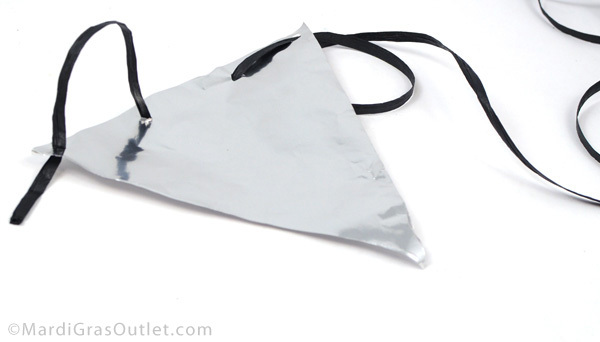 Using your template, trace the triangle onto the black foil paper and silver foil paper. Cut the shapes out using scissors. You will probably want at least 6-8 triangles, but you can make as many as you want! After you have traced and cut out all of your triangles, use an exacto knife or a hole punch to create 2-4 evenly-spaced holes across the top of each triangle. Make sure the holes are wide enough that your black ribbon or thread can pass through them. Be careful not to make the wholes too close to the edge of the triangle, otherwise the flags might rip when you are stringing them. Maintain about a quarter inch distance from the edges when punching out the holes. Unravel a bit of your thread or thin ribbon from the spool. Don't worry about cutting it off of the spool until you are done threading your flags on. This way, you won't end up with too little length, and it allows you to increase the size of your bunting as you work. Starting from the back of the flag, bring the thread up through the first hole to the front of the flag. Continue weaving the thread in and out of the series of holes until you exit the end of the flag from the back. Push the flag along the thread until it is the desired distance to create the length of bunting you would like. 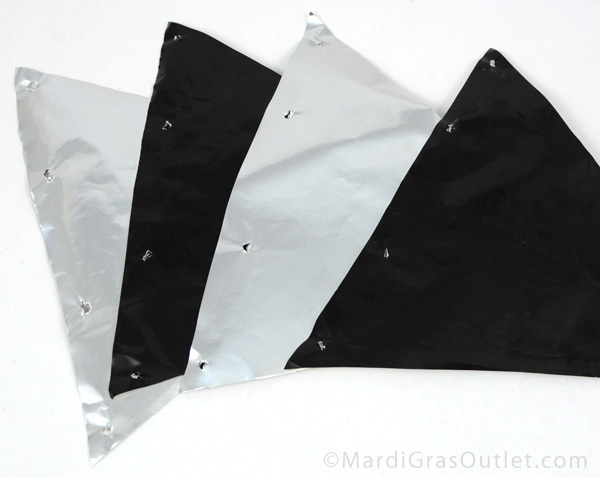 Alternate black flags with silver flags to create a pattern, or add in other colors of foil paper as desired! Continue threading your flags onto the ribbon, pushing each flag down to line up with the next as you go. Add as many flags as you like! When you are done, allow 1-2 feet of extra ribbon at each end of the bunting so that you can tie it up easily, and the cut the ribbon loose from the spool.